About 100 days ago, our product engineering team began experimenting with a three-day no-meeting schedule for individual contributors on our teams. 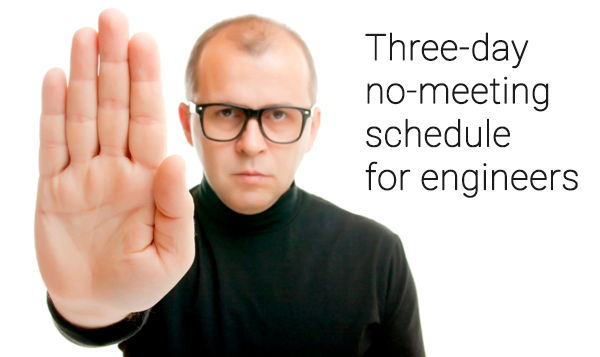 Over the past several months, product engineering managers have gotten very positive feedback about the three-day no-meeting schedule, and we recently sent out a three question survey about it. Obviously there are trade-offs when making a change like this. However, we feel that three focused days with two days of meetings is better than scattered meetings throughout the week. The survey results also indicate that the majority of engineers share that sentiment. My manager suggested we do what your team did and prolong no meetings from 1 to 3 days. It’s hard for me to thank you enough for this initiative. Funnily enough the Paul Graham essay about manager schedule vs maker schedule was trending last night on HN and re-reading it I was just thinking that I would love to extend no meetings to 3 days, and today I come to the office to my manager bringing up that you guys tried it and we could too… Thanks so much man! As engineering managers, it’s our job to provide the space and support needed to help our engineers deliver great software. It’s been amazing to see the impact of this seemingly small change on product engineering, and we’re really excited to see other engineering teams adopting it at Pinterest.